Fats consist of an extensive group of compounds which are basically insoluble in water and soluble in organic solvents. Fats can either be liquid or solid at room temperature, based on their composition and structure. Along with carbohydrates and proteins, fats are one of the three main nutrients used by the body as energy sources. The total amount of energy produced by fats is nine calories (37.8 kilojoules) per gram while carbohydrates and proteins each provide four calories per gram. Chemically, fats are triesters of fatty acid and glycerol, an ester being the molecule made under the reaction of an organic alcohol and carboxylic acid. All fats are composed of fatty acids which are generally chains of hydrogen and carbon atoms, with a carboxylic acid group found at the end of the chain. These molecules would have the shape of a capital letter E when the angles and kinds of these chains were straightened out to form a simple visual illustration. There are several different kinds of fats although each is a variation of the same chemical structure. Fats are known to have ester bonds due to fatty acids that are in horizontal line and the glycerol or backbone that are in vertical line and join the horizontal lines. The properties of a specific fat molecule are dependent on the particular fatty acids that constitute it. Different fatty acids are composed of a diverse number of carbon and hydrogen atoms. The carbon atoms form a zigzagging chain, each bonded to two neighboring carbon atoms. Longer chains are produced when there are more carbon atoms in any fatty acid. Fatty acids with longer chains are susceptible to van der Waals forces, an intermolecular force of attraction that is responsible in raising its melting point. Longer chains also produces greater amount of energy per molecule once metabolized. Saturated Fats. This group is by far the most important of all the different types of fats as they are needed for many bodily functions. Saturated fats are a natural substance that is being used by the body for several purposes. They are stable and are solid at room temperature, the body’s major source of energy and are commonly found in dairy products as well as in meat. Within certain parameters, saturated fats are actually good fats in the body. Saturated fats also help in enhancing the immune system, and are essential for the utilization of fatty acids. Unsaturated Fats. This type of fat contain a double bond between carbon atoms; unlike saturated fats that only forms a single bond. Studies have shown that unsaturated fats helps to regulate blood pressure, reduce heart disease, decrease inflammation and reduce blood clotting. They also help in increasing the good cholesterol (HDL) and to lower the bad cholesterol (LDL). HDL is produced by the liver for the purpose of repairing blood vessels and helps in transporting fat-soluble vitamins to the cells of the body. Unsaturated fats have two types: the monounsaturated fats and the polyunsaturated fats. Monounsaturated Fats. These are thought to be very healthy and help in reducing the bad cholesterol levels in the blood. Monounsaturated fats provide nutrients that aids the development and maintenance of the body’s cells. They have been shown to lower the risk of stroke and other heart diseases. Monounsaturated fats are found in olive oil, olives, nuts, sesame and sunflower oils, and other seeds. Polyunsaturated Fats. This type of fat are associated with both negative and positive effects in the body. They are directly attributed to the ratio of omega-6 to omega-3 fatty acids in the body’s diet. Omega-3 fatty acids are found in seafood, fish and fish oil and are known to be lower the risk of heart attacks. Omega-6 fatty acids found in sunflower oil also reduces the risk of cardiovascular diseases but can trigger inflammation and allergies. 3. Trans Fatty Acids. They are synthetically produced to help improve the shelf life of boxed foods and to reduce the saturated fat intake of man. However, studies have shown that trans fats are actually more dangerous to a person’s health than saturated fats. Trans fatty acids adversely affect the body’s cholesterol level and alter the function of cell membranes until they are not needed by the body. They are mostly found in deep fried foods, margarine, shortening and processed bakes goods such as chips, cookies and crackers. Fats are vital as they are needed for the production of energy, absorption of fat soluble vitamins (A, D, E and K), protect the body’s joints, and make up part of the brain. Fats insulate and surround nerve fibers that helps in transmitting nerve impulses. When blood sugar supplies run out (normally after four to six hours of food deprivation), fats provide back-up energy for the body. Fats are used by the body to make a variety of other building blocks that are needed for everything – from immune functions down to the hormones. When the body doesn’t have enough fats, it can lead to hair loss; dry and scaly skin; bruising; low body weight; poor growth; poor wound healing; lower resistance to infection; and loss of menstruation. Food contains a mixture of three types of fats: saturated, monounsaturated and polyunsaturated fats. Some of the most common food sources of fat include pork, beef, chicken, almonds, nuts, avocados, salmon and eggs. Although fats are basically needed in the body, they should be taken in moderation in order to avoid various fat-related health disorders. 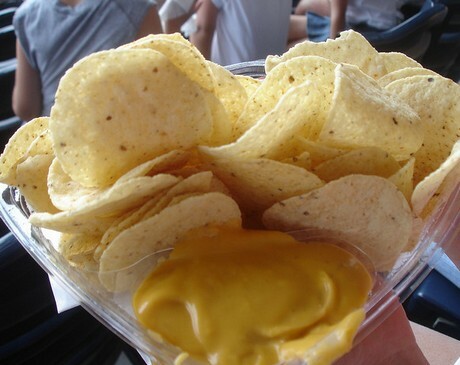 Fat Photographs: Cheesy Nachos by Navin75. 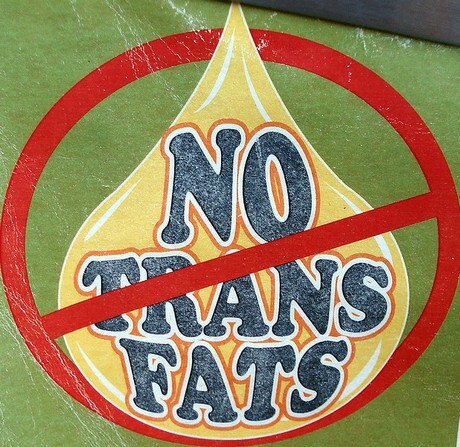 No Trans Fats by Myklroventine. Useful Information: Wikipedia, Harvard University, USDA Dietary Guidelines; MedlinePlus.